Remember that Final Fantasy Agito trademark filed a while back? Well it’s real and it’s most certainly related to Final Fantasy Type-0 – although not in the way you might think. No, this isn’t the HD version or Vita port some people might have expected. Square Enix is developing an alternate experience of sorts to Final Fantasy Type-0 that will launch on iOS and Android platforms sometime in 2014. FF Type-0 Director Hajime Tabata is said to be producing on the project, with Takeharu Ishimoto returning as composer and direction lead by Masayasu Nishida of Star Ocean fame. The base game will be free of charge, and players will be able to create their own character to participate in missions throughout the world of Oriense. Although the game is F2P, players can pay real money for items to recover energy points expended by taking on these missions as well as revive after mission failures and other gacha items. By deepening your relationship with certain characters, they’ll appear to help you at various points along the way. FF Agito is said to have improved graphics over the PSP version, which is somewhat evident in the scans floating around the net right now and not surprising given the leap in power today’s smartphones have over the a last generation handheld. The cast of FF Type-0 will return for this outing, although they’ll be stationed in different classes as the world itself has a different fate in store for them as another tale set in the mythology of Fabula Nova Crystallis. The game will feature a new character by the name of Myuu Kagerohi (voiced by Haruka Tomatsu), as well as returning characters Ace, Rem, and Jack. The main story will be told in chapters and with various player decisions and community voting, the story will evolve as you progress through the game. New chapters will be available once every two weeks and within those two weeks, ten days will account for Solo Play – allowing players to tackle missions on their own – while four days are set aside for Team Play where players will have to work together to defeat bosses. 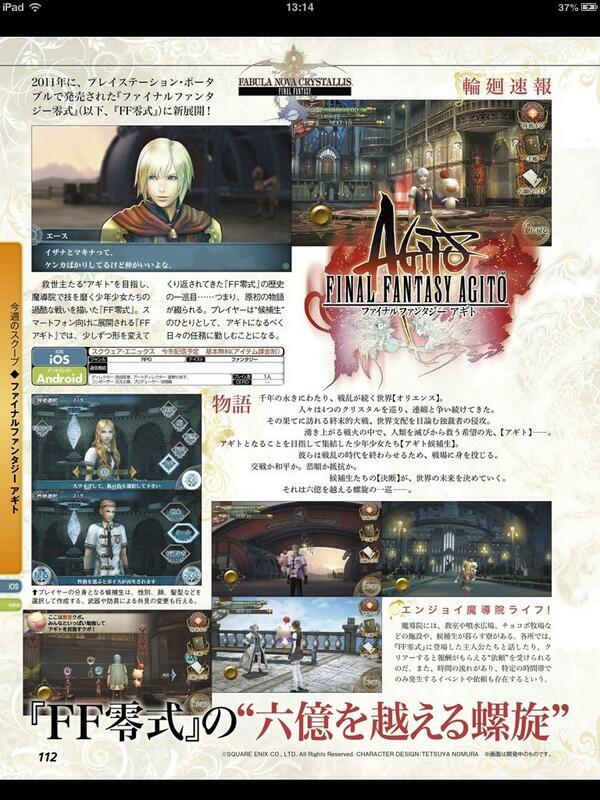 Agito will also play host to a job system and characters will have specific abilities based on jobs. Tabata hopes that those who played and those who didn’t pick up Type-0 will download and enjoy this new title. A full interview will be available online soon at Famitsu.com with more information on the game expected at Tokyo Game Show. Posted in Final Fantasy Agito. Well, if Tabata is directing, I think I can kind of feel okay with this. I just need to know how it plays. Hm, sounds interesting….not what we probably hoped for, but interesting nonetheless. Maybe we might get this…hopefully. I would be reasonably excited for this if only I could be certain it would ever see the light of day. They’ve shown no signs of intention to localize Type-0, so I find it hard to believe we’d get a mobile game that’s a prequel to it. Is something over Vanille’s face? It’s a small image, so I can’t make it out. Is her hair down? It appears that either her hair is down, or she’s wearing some kind of veil. She may also be wearing some kind of veil or half-mask. But playing Agito first will be good. I hope Type-0 localization will come out after that. We can only hope in the depths of our hearts. But I’m a bit sceptical. Square made some dumb decisions lately. Damnnnnnnn! I knew it! DAT TGS trailer will be ALL MY HYPE! I’m not sure how I feel about this announcement, but I’ll probably give Agito a try. OMG!!! Ok!!! TGS it is then!!! The whole cast in a single image! I want this in HD!!! Well, I still want the original (story) Type-0. Still, I’m happy to hear this. The only thing that doesn’t please me is the pay to heal stuff. They did that with … and I forget it’s title … and it did not sit well at all (from what I’ve heard.) I hope they’re not going to gouge us our money. This is definitely not what most of us was expecting. I feel kinda disappointed for it being another mobile game, but I like the idea of expanding the universe they started with Type-0. I still have hope they’ll localize Type-0 for PSVita. Even not knowing japanese, I played Type-0 (not entirely) and it was an amazing game. Hope they release a trailer for Agito on TGS! i think square is thinking serious about mobile popularity. just my opinion. Yeah, mobile phones and games are popular, that’s true. And Square Enix has a longer past dealing with mobile games, like Before Crisis or Dirge of Cerberus Lost Episode. Those were serious games, not just cash-ins. that *looks* fake as hell. EDIT: Note I’m not saying it is fake, just that it looks like someone did a hack job in photoshop. I’m not sorry that I don’t like it. Never said it was fake, said it “looks” fake. Troll harder. Looks can be deceiving; I’m not picking a fight, but don’t accuse me of saying something I didn’t. You are trying way hard to win you’re own argument. You still don’t understand what I actually said, but you keep commenting like you did. I think it looks cluttered and chaotic. I’m pretty excited about this as long as the pay walls aren’t too obnoxious. They’ll almost definitely localize it, it’s another FNC story and it could potentially garner more support for Type-0 proper. The concept sounds interesting. It feels like the first actually game under the ‘social game’ umbrella, unlike Guardian Cross. Complain about a Type-0 localization, sure, but you have to admit this is better than nothing. And I’m pretty damn excited. And graphics better than the PSP version? Is my smartphone really that powerful? 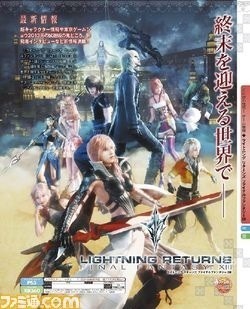 Pray tell how this cover is any different from past FFXIII and XIII-2 “renders” as you call them? That’s immaterial. Lots of people like XIII-2. Is their opinion invalid because they disliked XIII? It does. You asked how this cover differs from XIII and XIII-2 (which I only brought up as a touchpoint of how good their graphic design can be). I like LR’s cover, but you bringing it up is immaterial to this conversation. Again no one is talking about the Lightning Returns cover art. If you *want* to talk about the LR cover, that’s fine, but the way you brooch the subject is less than intuitive. What I’m referring to is the key art linked above. I think that and that only looks chaotic and messy and far below the standard SE usually sets. But if you want me to compare it to the previous versions key images, that’s okay too. Yes, cover. I understand what the word cover is, and specifically didn’t use the word “cover art” to define the cover of an actual game box/case. Cover, as in, Lightning Returns’ cover for Famitsu. Now, I don’t know what this issue of Famitsu’s cover is/was on the front of their magazine, but this was their “cover” page (it doesn’t seem to be a double-page spread) for the LR article, right? When I responded to your comment, two of SE’s past “renders” or what I consider “covers” (now common wallpapers) was in my mind. And if you want me to link them I can. That’s what I was referring to, so when you brought up whether people liked XIII-2, yada yada, it confused me. That’s all; clear as crystal. No need to whip out the italics. I think this is bad. I’m certain I’ve said that already. And whether I liked the others has nothing to do with anything. I generally feel the same. I try to avoid getting upset about the internet and its dealings. Might I suggest http://www.rainymood.com/ ? Sorry but…..this won’t do….FF Type-0 cannot be captured on iOS – seeing the story changed….idk….i guess il go back to the jap version and try and remember the story from memory….and menus, weapons and items etc……very sad…..Type-0 is an amazing game, favorite in the series and it fails to make its way overseas….i am saddened to see those who cannot play the jap version will never play this truly amazingly put together game…..can’t get over how depressed i am :l Although some may say this is still something, it isn’t type-0…or at least, the type-0 we have all been craving! Why would it being on iOS and Android change the story? It seems like they’ll be able to pack just as much content onto the smartphones as a last-gen PSP. Not only that, but a smartphone screen isn’t that much smaller than a PSP’s screen. 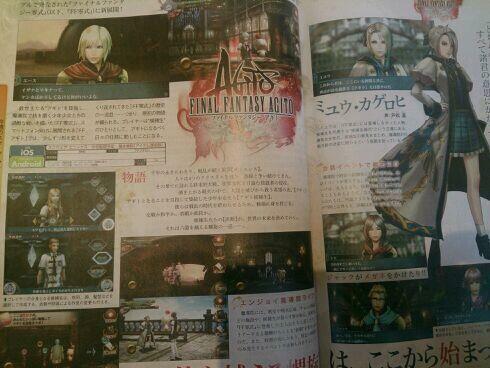 After all, according to one of Erren’s tweets this is supposed to be like a sort of reimagining of Type-0. And I just thought of something. If anyone’s really disappointed about the “first” Type-0 not being localized (or yet I guess :?) well a YouTuber said she’s planning on doing a full-scale walkthrough with translations of all button and dialogue stuff. She isn’t telling a lot of people because she’s a scrub but I just thought people that don’t like this idea should know that there ARE translations and things. :/ Maybe not the best thing, but she’s the one who pretty much translated everything for me so I COULD play T-0. The way your comment read to me was that BECAUSE the Agito is on smartphones the story would be negatively affected. That and a PSP and smartphone screen are almost the same size. And who says they’re not going to announce a localization? People are talking about something at TGS, and I’m feeling it too. Well I don’t know about you, but the PS3, X360, and Android sitting a few feet away from me are all gaming devices. I can play different types of games on all of them, and just because my phone is used for a crapload of others things doesn’t mean it can’t work as a gaming device. Uh, maybe I’m interpreting the comments wrongly, but people seem to be under the impression that this game will be localized. If Type-0 wasn’t localized, why would its prequel?